Learn all about KD's newest signature shoe and check out several exclusive development samples in this interview with Nike Basketball's Leo Chang. As the trajectory of superstar Kevin Durant's career continues to climb, Nike Basketball is also continually pushing to ramp up his signature series. Design Director Leo Chang has led the charge each year since Durant signed his massive $60 Million deal with the Swoosh out of college, and for KD's fourth model, the direction was to get lighter and tighter. Along with keeping performance upgrades in mind, Chang also looked to design an even more inspiring silhouette and upper, blending together a Hyperfuse construction with an entirely new strap system dubbed "Adaptive Fit." We sat down with Leo Chang and developer Dolores Thompson just as the lockout-shortened season was getting underway to get all of the details of the Zoom KD IV. 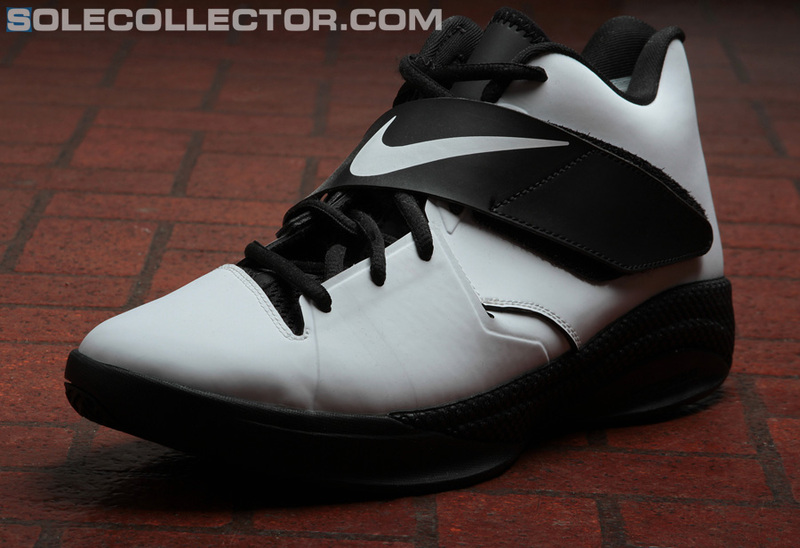 Nick DePaula: With the Zoom KD III, Flywire was the main support element. 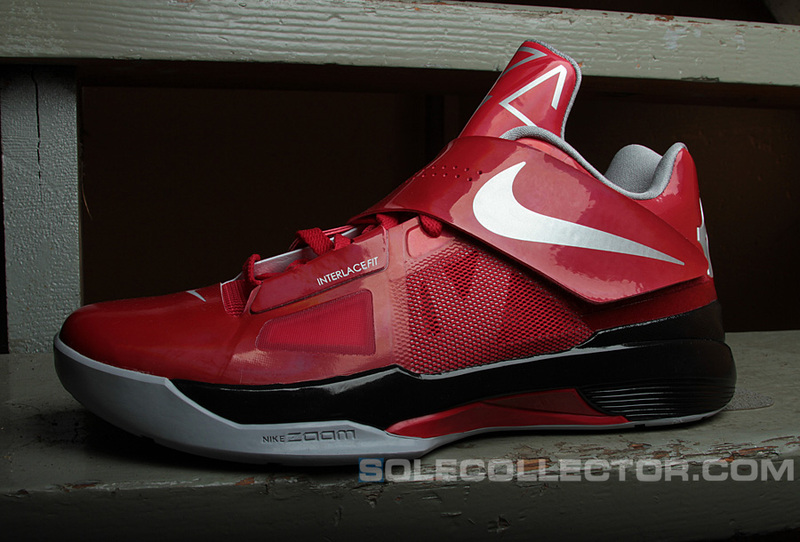 How far back when you were designing the IV did you start creating the Adaptive Fit system? Leo Chang: When we were a little further along with the III, I had some conversations with Shane Kohatsu and Fred Dojan in the [Innovation] Kitchen about getting KD onto the innovation plan and getting them involved. They had been working with this idea that had originally been called Interlace Fit. It kind of keyed in on the key points of the foot that you really need to lock down for the best support. 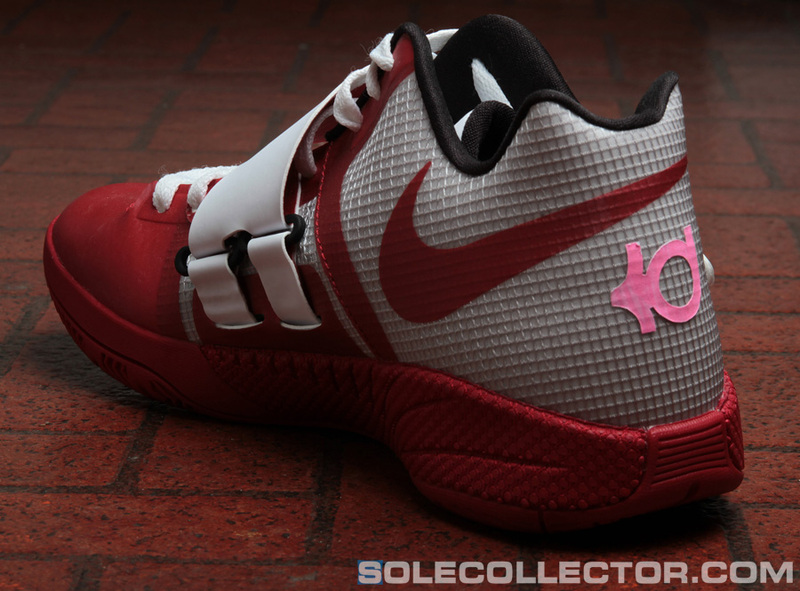 I had been mulling over in my head how I could take the KD line further. On the III, we had this whole story on the bottom. It probably wasn’t super obvious, but we had five lightning bolts, and they symbolized team, because KD is all about team. So, I thought that was a cool story, but how do I take that and make it deeper and more performance? How do you do it so that each player can almost have a customized fit and adaptive fit? So, talking to Shane and Fred and working on this idea, I thought it could be a perfect concept for KD. Every now and then, he’ll have almost all five guys on the court potentially wearing his shoe. That was the original idea: How do we get the team idea of adapting around each member’s foot and having it fit to their needs. When you look at where the foot varies the most in size, it’s typically the arch and forefoot. We actually started out with samples where we had the adaptive fit in the forefoot, too, and then locking into the arch. Because of our switchover to this more narrow and tighter-fitting last, we went through rounds and rounds of testing, trying to get that forefoot to loosen up. But at the end of the day, we took a step back and realized that the last was so snug and tight that you don’t need additional stuff there. 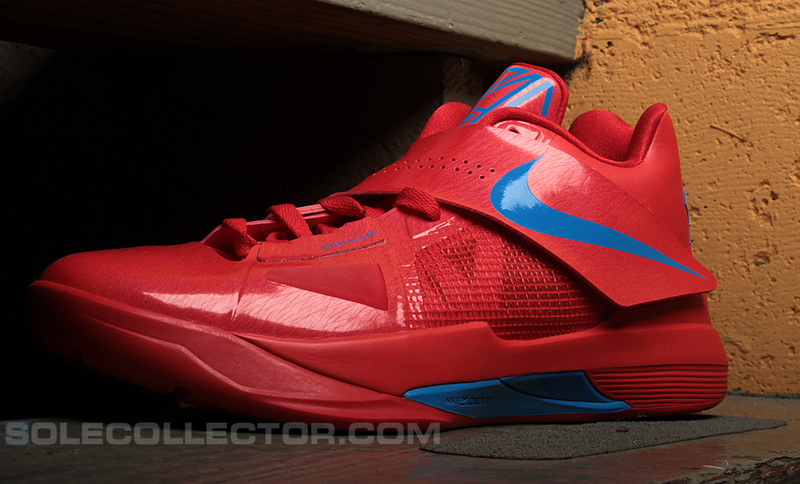 No one’s ever complained about the Kobes, the Hyperdunk 2011s or the Hyperfuses being too sloppy. Why add more to that area? Dolores Thompson: Having the strap in there created issues with the forefoot. By removing it, it certainly alleviated some of the extra layers. We put perfs in it, we made it out of a super-thin synthetic, we did everything that we could, and it was still causing irritation. At the end of the day, we had to go back through legal to make sure we could still do this. We put a patent through for the Adaptive Fit system, and we had to make sure that those two straps weren’t connected or linked together. NDP: How does the Adaptive Fit system work? LC: The basic premise of Adaptive Fit is that typically in a shoe, depending on your foot shape, there could be gaps in the shoe. How do you fill in the gaps between the foot and the upper? The idea here is that you have these bands that tack down to the center of the strobel. If you have a super high arch, and you pull up, it will fill in the gaps and meet your foot. Then you have this feel that the upper is constantly touching and hugging your foot. DT: Through every round of testing, multiple testers commented that it was the first strap that they could actually feel working. 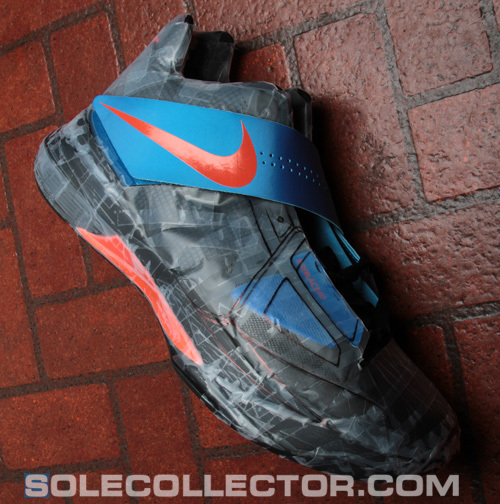 NDP: What did KD think about the Adaptive Fit being incorporated into his shoe? LD: It’s kind of funny. 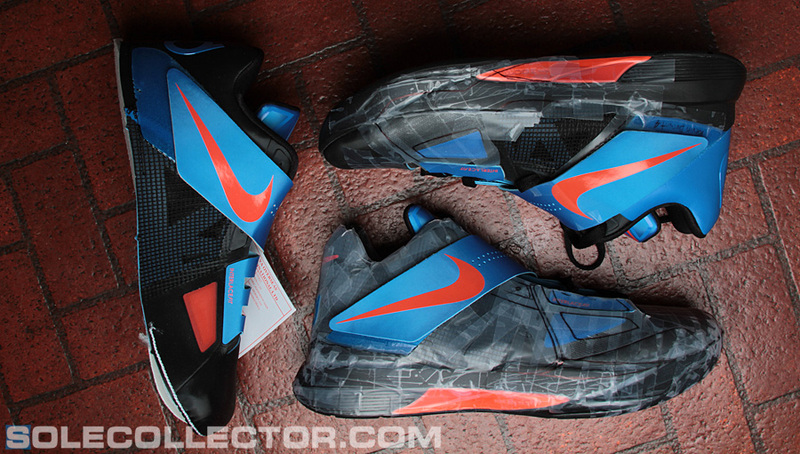 Last summer, KD went to Shanghai, and I was on my way to the factories in Taiwan. So I figured I would stop by along his China tour and connect with him. I was just there for a day and was kind of following him around to all the press interviews and all the different events. We were in an elevator and about to get into a van to go to NIKETOWN for a huge event. And in the elevator, as we are leaving the press conference, Chuck Terrell [Nike Sports Marketing] says, “Hey KD, what do you want on the IV? What are you thinking?” And he goes, “You know, I’m thinking no strap.” [laughs] So I was like, “Alright, great.” [laughs] We got in the van then, and were chatting a little bit more about what he wanted. I had brought these samples on a Hyperfuse bottom and thought I might as well show him, just to see if there was anything he liked about it, or anything that resonated with him. I tossed it his way and asked what he thought, and he was really excited to see it. And that was how I turned him around. A conventional way of doing a strap wasn’t what he wanted, but he saw something compelling here that was exciting. 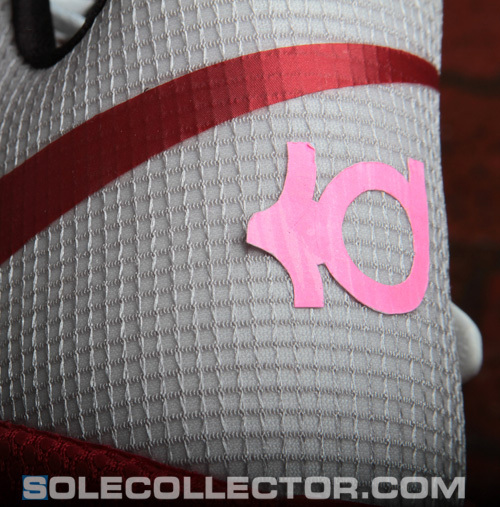 DT: It’s really good that we are able to bring some innovation to his shoe at his price point. It certainly gives it more value. And it shows that we are investing in KD, too. LC: That was a cool and interesting moment that could have gone really bad, [laughs] after having invested a lot of innovation time into it. But luckily he loved it. NDP: That sample was pretty rough. Does he get the concepts pretty well off of something in that stage? LC: He really trusts us to do our jobs, and I don’t think he’s one to nitpick. But I told him that it was really rough. I’ve done that since the beginning with him, with every round. With the III I showed him a really busted sample that I probably shouldn’t have even shown to him. But he’s always embraced those things, and I think he kind of appreciates me taking him along through the process, and not just showing him a polished rendering and sample. That means he can interject his thoughts and ideas throughout the process. NDP: The strap was a lot different from the II, but it seems like some things were carried over, like the height. 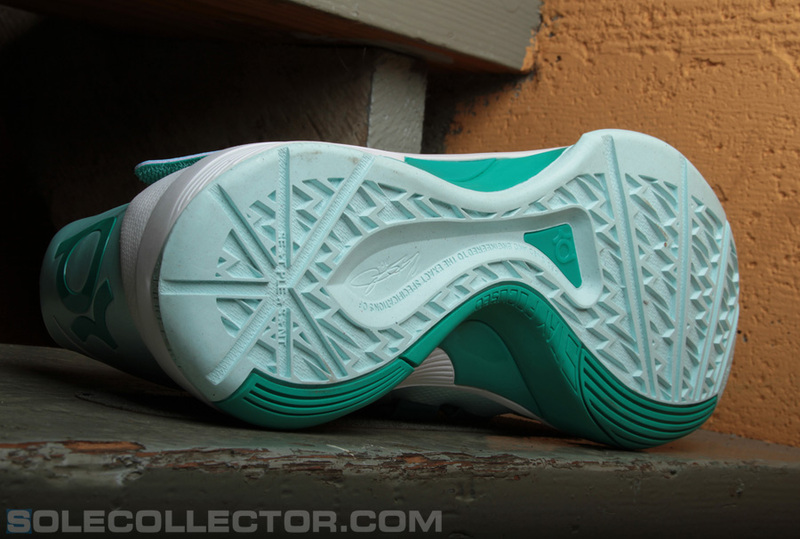 LC: The III was almost a little bit higher, like a Kobe IV kind of height. With that, we decided to go a little bit lower, and he liked it. He loves his shoes to be light and tight. That was definitely something he wanted to continue. And the shank carried over from the III. It was a sweet shank, and it works. Let’s not try to reinvent the wheel. NDP: Was there any other feedback that KD gave from the III that influenced anything? LC: It was really just his thought of always trying to get lighter and tighter. You’ve seen him the last couple years – he always has the same pair of shoes. I have a pair of his shoes in my office, and they’re falling apart because he wears them for five months. For him, he does that just because it’s in his nature. He’s still very humble, and he feels like it’s a privilege to have a signature shoe. DT: Even the MLK shoes that he wore last year, he took a black sharpie and sharpied out all of the gold so he could wear them as an all-black shoe. LC: [laughs] He took some areas and blacked out the gold and took almost a photo blue marker and markered in some of the other areas. For the longest time, we were looking at it and wondering, “What is he wearing? We didn’t do that for him.” And sure enough, we got the sample back, and it’s all markered in and stuff. And also before, he felt like he really needed to break in the shoes. And that was a cool thing. We met him in Chicago for his Skills Academy, and that was the first time he got to try the IV on, and he was super excited. My flight was getting in a little later, and KD had just landed, and he had gone straight from the airport to the gym. He didn’t even bring another pair of shoes and was sitting there in his flip flops and socks, waiting to try his shoes on. He’s never one to make us wait or anything. He was there because he was excited to try on his new shoe, and he was there early. LC: For months, leading up to that time in Chicago for the IV, he had been texting Chuck, asking when he could wear the IVs. And when he put it on, he instantly felt like it was a lot better fit. NDP: Last year, you didn’t have that many different sketches. You kind of had a concept and went from there. 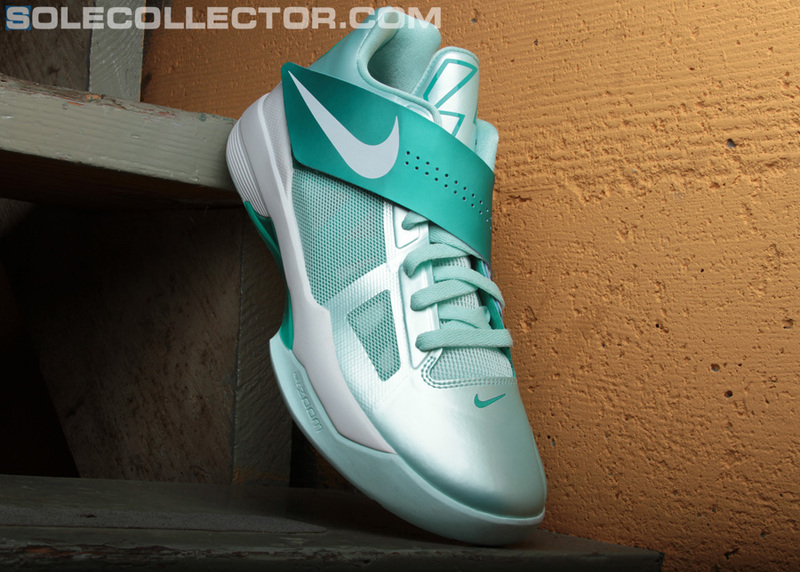 Was this shoe the same? LC: I think for me, I work differently on different projects. This one was very 3D. DT: We started this early, because of the innovation aspect of it. That first sample, to what we ended up with, didn’t change a lot. We had all-over Fuse versus just forefoot Fuse and things like that. We had to evolve it. But in general, the lines didn’t change much. Some of the best designs start out great from the beginning and you don’t have to change them much. NDP: Are the small 4s on the outsole just because this is the fourth shoe? LC: Yeah. And the shape of the 4 was just me drawing this 35 logo for the tongue, and then looking at the negative space between the 3 and the 5 and creating that shape. NDP: One thing I’ve noticed is that I’ve been playing in the Nerfs a bunch, and they look almost brand new compared to all of the creasing I had in the IIs and IIIs. LC: That’s the thing with the Fuse stuff is that it doesn’t blow out. DT: That’s what I like about Fuse is that it’s a well-made composite. If you pick the right materials and the right hot melts, you’re going to have a shoe that lasts a while. It’s not going to give you a lot of variation. NDP: The III had the video game button details. Were there any specific details like that here? LC: For sure. On the III, one of the things that we kind of missed out on was that he had hit up Chuck Terrell and asked to get “Big Chucky” on the III. But at that point, we were already in production. We told him we could get it on his promo shoes. And the main difference between his and the retail versions was that on the inside of the medial strap, we printed “Big Chucky.” That was something that, from a storytelling standpoint, was really important to him. So for this one, we put it on the heels of the shoe. Big Chucky is Charles Craig, his childhood coach and mentor, and sometimes he even calls him his godfather. And he died at the age of 35. That’s why he wears 35. We met with KD in OKC in December of last year and showed him the shoes and a bunch of colorways, and he was just going crazy for them. And then we got into more details about what else he wanted from a storytelling standpoint. The first thing he asked was to get his brother Toney’s name on it. He was there too. And then later on I thought, I could just throw it on a random font and call it a day, or since Toney was right there, why don’t I just get him to write his name out himself. They call him “Toneyman,” so I just had him write that in my sketchbook. 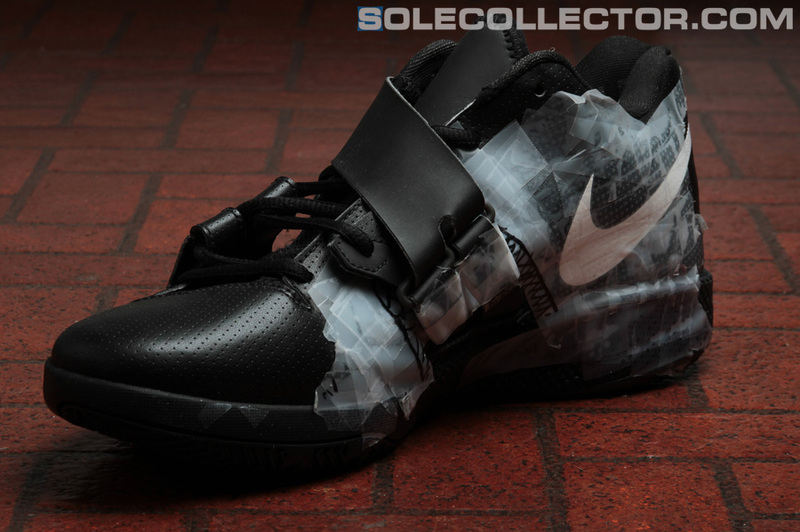 Then I just scanned it in, and put it on the shoe. “Barbara” is there too, and that’s his grandmother. She was really important to him, too. Just growing up in Maryland, his mom was a single mom, working at the post office, which was tough. But he had a great support network of his family. He lived with his grandmother for a while, and she always took care of him whenever his mom wasn’t able to be around and was working. It’s something that’s tattooed on his chest – Wanda and Barbara – his mom and his grandmother. 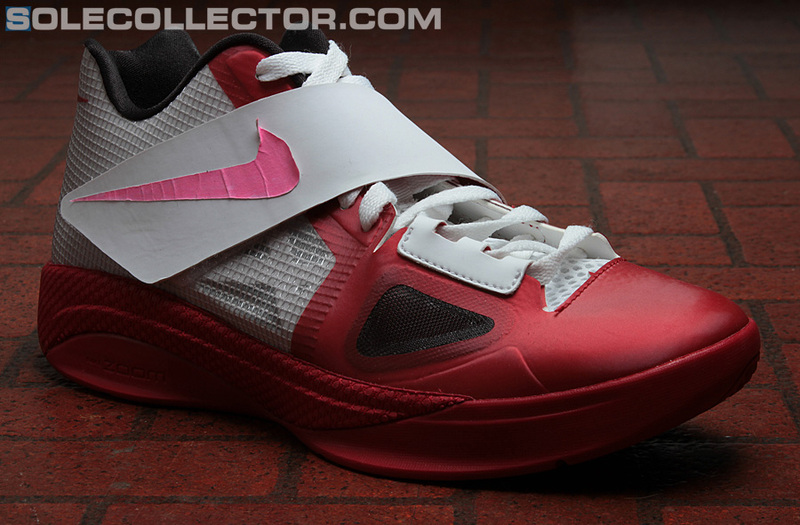 He definitely wanted to pay homage, and those are things that will continue to be on his shoes. DT: And they’ve been on all of them. LC: It’s just a matter of loyalty to him, because family is super-important to him. That’s why he’s such a humble kid. The other thing, too, is Seat Pleasant is something that he wanted to represent; that’s where he’s from. And within the Seat Pleasant logo there’s three stars, and that represents the three stars from the D.C. flag. And as you can see here, it says “Designed and engineered to the exact specifications of,” and then has KD’s signature, “and company.” The “and company” aspect is just what we talked about earlier: his team. He’s the ultimate team player, but he’s clearly the captain of the team. And then, as you can see on the left and right outsoles, it says “Stay Focused” and “Work Hard.” His quote coming into the League was, “Hard work beats talent when talent fails to work hard.” That continues to stay with him. He’s definitely one of the hardest working players in the League. “Stay Focused” actually came from when I was looking at the pictures of the Hyperfuse that he wore in Turkey and he had written “Stay Focused” on there. I thought that was pretty cool. That was his mentality going into winning the Gold there. And then I thought that it was even more relevant. 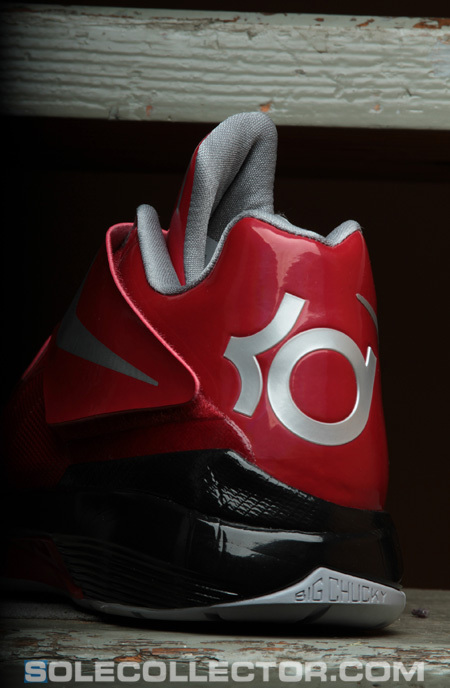 At the time we were designing and creating the shoe, there were whisperings of a lockout. It was one of those things to just make sure he was reminded to stay focused on basketball. NDP: Man, if KD came back fat, that would have been the biggest surprise ever! NDP: It’s disappointing, but it seems like nobody did. DT: They had so many of these games for charities that I think they were worried about that, too. LC: This lockout was so different from the last lockout. All of these players get along and want to help each other and the League. They want the fans to enjoy the game. And that’s why KD, being the uber basketball guy that he is, he made an effort to go to every basketball game he possibly could. The ones he was invited to, and he would just show up anywhere. NDP: Did you talk to him about playing in any of those games and get a sense of what it was like for him? The Rucker game was obviously a big one that everyone heard about. LC: It was probably the most exciting moment of his career, I think, because there was so much energy. DT: And it was closer to his roots. LC: And I think he even said, when he hit the five 3s in a row and all of the sudden the crowd rushed the court, he felt like he won a championship.